Having a broken iPhone charger cable is exceptionally annoying, not only because they become extremely delicate and often wind up failing completely, but also because it’s only a matter of time before you’ll need to replace the thing and toss out the broken cord. Aside from that, they can also throw various errors, and if they’re badly broken or ripped they may not allow backups and syncs to occur at all, let alone fail to charge the iPhone or iPad properly. 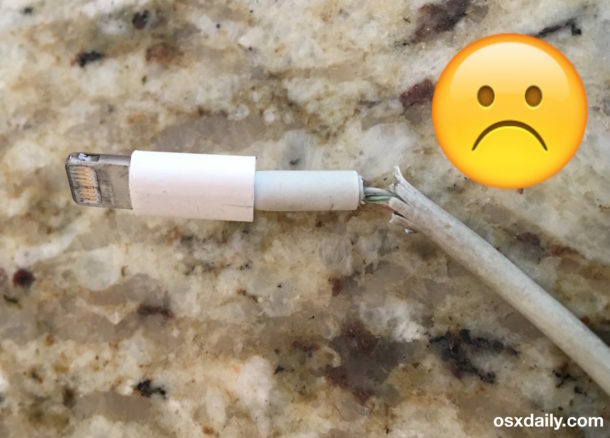 If your iPhone charger is broken, should you try to fix it? Or should you just replace it? Because a broken, torn, ripped, damaged, or frayed charging cable could be a hazard, the best thing to do is to replace it. You can get a cheap replacement on Amazon for just a few bucks, and the Amazon brand of charging cables appears to be notably more durable than the official rubber cables, and certainly better than low quality third party knockoffs. While you’re waiting for the new cable to arrive though, maybe you’ll want to try and get a few extra hours or days out of the broken cable. So before you toss a broken or ripped iPhone charger into the garbage though, you might want to consider a temporary fix of sorts that could prolong its lifespan a bit until the new cable comes in the mail. And if you’re lucky, it may last quite a bit longer. The magic temporary fix to a broken iPhone charger? Good old electrical tape. And yes, you can patch repair the same iPad charger this way too. 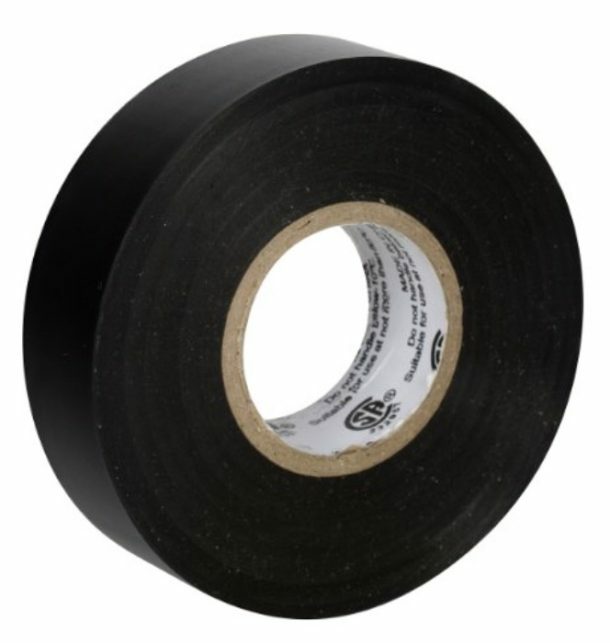 Yes, electrical tape, everyones favorite tape (well, next to duct tape anyway). It can assist in a Do-It-Yourself repairing of a ripped charging cable for iPhone, iPad, or iPod touch, and help it hold together for a while longer. It’s not foolproof or perfect, nor should you rely on this for longer than you need to, but it can certainly function as a temporary fix or interim solution until you can replace the cable. 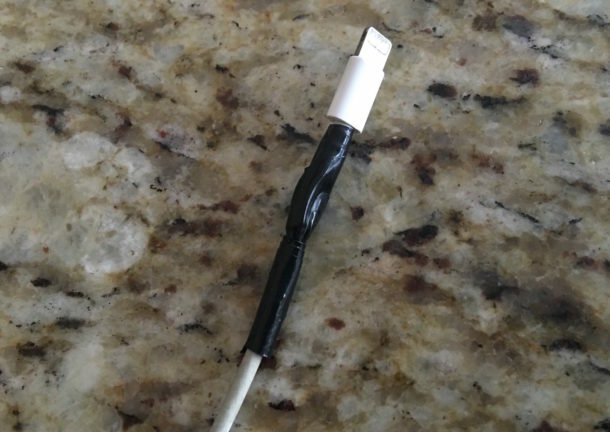 So pull out your tool box or explore the gadget drawer and grab some electrical tape, then carefully wrap it around the ripped or torn portion of the iPhone charger cord. Yes it can work if the damage isn’t too bad, but no it’s not necessarily perfect. And no, it’s not a perfect or permanent fix, and no, it’s not a perfect repair. If you want a perfect repair, it’d require wire cutters, a soldering iron, and a replacement rubber sleeve with a side of patience and electrical know-how, but again for a simple quick little patch repair job, electrical tape can hold a shredded iPhone or broken iPad charger cable together quite well. Of course, use your discretion with this. Electrical tape is not the magic solution, and will not prevent electrical problems or worse. If the cable is severely damaged, or sending out electrical shocks, or smelling funny, or melting, or burning, or getting extra hot, you need to toss it and just get a new cable. Do not try to use a clearly melting or hot or dangerous charger, and do not try to repair a charger that is clearly sketchy. Don’t try to repair a severely damaged cable yourself, just trash it and get a new one. Use your brain, don’t try to MacGyver an irreparably destroyed broken iPhone charger. Forget It, Replace the Broken iPhone Charger. Seriously. Seriously, just get a new cable. Don’t try to use the broken cable forever, it is asking for trouble, and eventually the thing is going to fail. 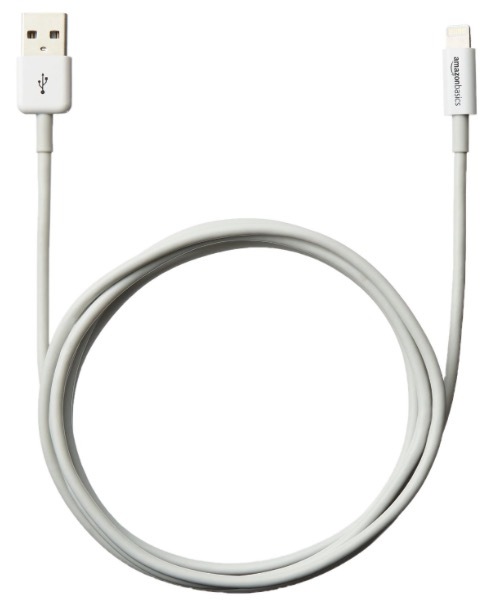 Replacement iPhone and iPad USB cables are on Amazon for low prices and will arrive quickly, they represent a perfectly satisfactory option if you don’t want to spring full price for an official cable from Apple and are typically 1/2 the cost. It’s also worth remembering that Apple sometimes replaces frayed lightning cables for free, though success with getting a broken or torn cable swapped out seems to vary widely. But if you’re near an Apple Store and it’s not much of a hassle, it’s probably worth attempting to get a broken cable swapped out. If your primary device is still under warranty, you can even call the official Apple support phone numbers and they may be able to swap it out for you. It’s worth a try, that’s what a warranty is for after all. What do you do with your broken iPhone or iPad chargers? Do you replace them? Try to MacGyver them with some tape and do a simple repair on the cable? Let us know in the comments if you have some great solution! Dude, shrink wrap not electrical tape, and do it before it’s totally busted, I cover mine in shrink out of the box, they last 5x longer. Yep. A tiny bit of heat shrink tubing will instantly fortify the strain relief area and prolong the usability. This mod works really well on headphones plugs also (which are notorious for fraying internally resulting in the sound only coming out of one side). I use the Amazon Lightning cable and they are strong haven’t had one fail yet. Have one on the car where it gets heavy use. I only use the flimsy apple cable at the desk. I have had at least 5 Apple cables break and fall apart. My charging port was actually the last straw that broke the iPhone back for me. It’s shoddily made and I got tired to messing with it. Or dealing with the ‘tude of the “geniuses” at Apple’s stores. Replaced it with the Galaxy S7 edge, which seems much better constructed and a far better phone. Still love my 27″ 5k Retina but no going back to iPhones. Really? Would you buy a new TV because the content sucked? Weird, man. Uh, how is a technical flaw, a technical weakness a “content” issue? Weird, dude. No, what’s weird is you thinking that a bad cable means that the iPhone is not well constructed. So if you get a flat tire you buy a new car? Samsung phones are not made better. Look it up. 27% of familiars in Q4 2015 were Samsung phones. That’s “failures” not “familiars” lol Damn auto correct! I think the key phrase here that some people may have missed is “My charging port was actually the last straw that broke the iPhone back for me.” If John is somewhat like me (love my Macs, hate my iOS devices) then the horrendously cheap (in construction, not cost) cables are the proverbial straw that broke the camel’s back. Probably the end of a long chain of things that either don’t work (software-wise) on the iPhone and haven’t been fixed in ages or the complete lack of innovation in recent years. 6 months ago I bought a $3 CDN lighting cable that “just works.” iPhone 6 will be my last iPhone and I’ve got my eyes on the Galaxy s7 edge or whatever comes up next. I have fixed a couple cables which are completely ripped in two. Just strip the wires and twist them back together, and wrap each individual one in tape before wrapping the whole bundle. Of course, it’s EXTREMELY important that you match the right wires… in 7th grade I wrecked a school MacBook’s logic board by trying to be smart and rewiring the charger backwards. What do people do to break these cables as pictured here? Do people not plug them in and remove them with the hard plastic part and just pull on the soft part of the cable? On a personal note, I’ve never had one of the older 30pin, or the newer Lightning cables break (in over 10 years of owning iPod’s/iPhone’s/iPad’s). I have yet to damage any of my Apple cords but I purchased an Amazon Basics lightning cable just to have a spare and it’s of excellent quality – thicker, stronger, longer and costs less. Protects the cord, at the weakest point. This is a very annoying problem, I’ve had this happen to me multiple times. Purchasing a third-party cable seems to give my iPhone an error message I do not understand why Apple just can’t make the cords!last as long as the phone does ! Apple hardware reliability going down the tubes; higher prices, lower quality…. I have used Sugru, see Sugru.com. Leave it a day rest and your cable is very sturby again and looks good. +1 for Sugru. I love that stuff; use it to fix everything from engines to slamming doors. Your article refers to the USB-to-Lightning cable. Apple as well as other mobile phone companies have a good hustle going on with chargers. You figure with all the money they make, they can’t put the time into making a more durable cable and port. I try to avoid sabotaging my iPhone wires with pre-tapping it in the start. It is hard for me to get original lightening cable here in my area. I would like to know if that is works. Yes replacing the broken iPhone charger with a new working one works. You can try taping a torn one as a temporary measure until you get a new cable. I’ve had these things fail. What works to prevent this, at least for quite a while is to use electrical tape (or even duct tape) and make a few wraps starting UP AGAINST the ends of the cables, so that the cable is prevented from bending where it meets the plug on either side. It will bend near the beginning point of the wrap (on the cable, not near the end plugs). You can even wrap more later to make it bend further up the cable than where you started the first wrap. I had a similar problem with a fraying cord and created this product to help all others experiencing the same issue. Takes 20 Seconds to install and requires no tools. If your charger no longer connects to your phone then CordCondom cannot bring it back but we do sell MFI lightning cables with CordCondoms applied. Our products ship free and in under a week worldwide. I’ve been thinking about finding something that would protect that sensitive “neck area” where the actual cord connects to the lightning charger tip because it just bends in that spot so easily, especially when I’m using my iPad while it’s charging…usually in bed when I’m being haunted by insomnia. So I worry a lot about my cord being damaged when it’s not sitting flat while it’s charging. Thanks for the guide. Will try this. If the wire isn’t completely broken and if it is still working, you can also add some MSeal around it, this worked well for my adapters. Besides, I think it is a better idea to prevent cable breaks rather than fixing it afterwards.